'Today The Sun Falls In The East' is the first instrumental album pressed on wax by El Jazzy Chavo. The album theme style is based on the sound of the 70’s soul-jazz refreshed with the classic downtempo boom bap techniques. 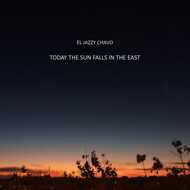 'Today The Sun Falls In The East' was entirely produced by El Jazzy Chavo. Last 3 bonus tracks available only on physical formats and/or after purchasing the digital version.